Steinway Beer Garden in GTA IV. Slug 'em and toss 'em at this classic Irish drinking spot where darts are available for anyone who can still walk straight. Head to the Steinway Beer Garden if you think you're hard enough. - Grand Theft Auto IV manual description. 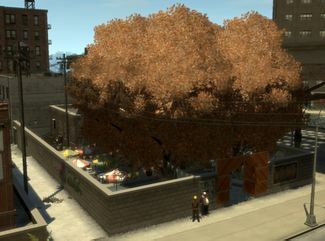 Steinway Beer Garden is a drinking venue in Grand Theft Auto IV and Grand Theft Auto: Chinatown Wars, located at Yorktown Avenue and Morris Street in Steinway, Dukes. The Steinway Beer Garden is essentially a combination of an Irish pub, and a beer garden, an open air drinking venue which trace its origins to Germany. Indeed, the Steinway Beer Garden compound comprises a permanent single-storey public house as well as a shady open air space furnished with seats and tables, although there is actually little use of the exterior seating in-game. The interior of the public house in GTA IV is closer to resembling a classic Irish drinking pub, being identical to the interior of Lucky Winkles in Purgatory, Algonquin (down to the portrait of Derrick McReary). Advertisements for various alcoholic beverages, in particular Blarneys Stout, adorn the garden's outer walls. Players in GTA IV and its episodes can take girlfriends or friends out for a drink or play a game of darts beforehand, making it a good destination in outings with Roman Bellic or Patrick McReary. Because Steinway Beer Garden shares the same interior as Lucky Winkles, Steinway Beer Garden is the only venue besides Lucky Winkles where the player can play darts. A game of darts at Steinway Beer Garden. A TV commercial for Steinway Beer Garden. This page was last modified on 16 May 2014, at 14:23.